Andrea Penrose (aka Cara Elliott and Andrea Pickens) introduces a new Regency-set mystery series with this novel. The chilling prologue allows the reader to witness a murder in St. Stephen’s Church on Black Swan Lane in London. The victim, “his face burned by a noxious chemical, his throat cut from ear to ear,” is Rev. Josiah Holworthy. Because the animosity between Holworthy and the Earl of Wrexford, an aristocrat careless of his reputation but exceedingly careful in his scientific work, has been made public through scathing exchanges in the Morning Gazette, Wrexford is the prime suspect. 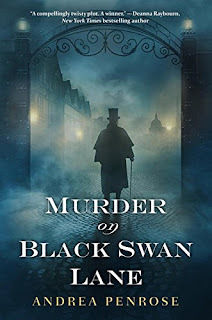 Placing little faith in Bow Street and an investigator who appears determined to see the earl charged with the murder, Wrexford sets out to find the guilty party. His first task is to discover the identity of A. J. Quill, a satirical cartoonist whose latest sketches reveal a detailed knowledge of the crime scene. Charlotte Sloane took over the role of A. J. Quill upon the death of the original Quill, her husband Anthony, over eight months ago. More gifted than her husband and utilizing a network of street urchins as sources, Charlotte has seen the reputation of Quill soar. All of London eagerly consumes her cartoons. Charlotte is making enough money for her needs and to provide food, clothing, and education for two of the urchins, a pair of cheeky brothers known as Raven and Hawk. The brothers and an old friend, who also feeds her material, are the only ones who know that Charlotte Sloane and A. J. Quill are one and the same until Wrexford’s aggressive search oiled by money leads him to Charlotte’s home where he belatedly realizes that A. J. Quill is a woman. Wrexford uses a combination of persuasive words and outright bribery to convince Charlotte to trust him enough to team with him to solve the murder. The mystery becomes more dangerous and sinuous as the duo uncovers threads twisting back into the history of alchemy and reaching into England’s social system and the Regency’s fascination with science. The relationship between Wrexford and Charlotte is equally complex, developing in increments from wary partners to friends, with the suggestion that the platonic has the potential to turn romantic. I am a fan of historical mysteries, and I would rank this one among the best. I loved the premise of a female cartoonist and an unconventional aristocrat as protagonists from the get-go, and Charlotte and Wrexford exceeded my expectations. They are both complex characters who sustain interest even without the mystery. Irresistibly engaging as individual characters, they are even more intriguing as partners in detection. The novel also offers an abundance of fascinating secondary characters: Tyler, Wrexford’s remarkably efficient valet/lab assistant; Christopher “Kit” Sheffield, Wrexford’s close friend since their schooldays; Basil Henning, an acerbic “medical man” with a soft heart; and the irrepressible Raven and Hawk, who win—and sometimes break—the reader’s heart. I found the use of Kit, the younger son of an earl, especially interesting in his role as a foil for both Wrexford and the chief villain. Penrose wisely wraps the central mystery up with no loose threads while leaving the mystery surrounding Charlotte herself largely unresolved, thus leaving her reader satisfied with this story and eager for the next. This novel is not a romance, but it is an intelligent, literate story such as readers of Cara Elliott and Andrea Pickens expect. Charlotte’s marriage and her relationship with Wrexford should appeal to romance readers who are not adamantly confined to books with HEA endings. If you like historical mysteries, Regency settings, or just smart, lucid fiction, I highly recommend this book. Thanks for your review. I just picked this up from the library the other day, but haven't started reading it yet. I have this on my TBR list! Love historical mysteries so this sounds right up my alley! This is another book I am anxious to read. Mysteries are more and more becoming a favorite genre of mine. Thanks, all, for the comments. I am excited about this series. I hope you all read it and enjoy it as much as I did. I didn't know they were one and the same. I've enjoyed her historicals but pretty sure this is something I would enjoy too. A belated thanks so much,Janga! So glad you enjoyed it and really appreciate your nice words!